Mikhail Zygar is the founder of Future History - a creative digital studio behind Project1917 and 1968.digital. He is a Russian journalist, writer and filmmaker, and the founding editor-in-chief of the Russian independent news TV-channel, Dozhd (2010 - 2015). 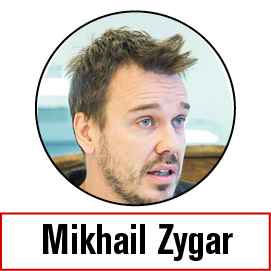 Prior to Dozhd, Zygar worked for Newsweek Russia and the business daily Kommersant, where he covered the conflicts in Palestine, Lebanon, Iraq, Serbia, and Kosovo. His bestseller All the Kremlin’s Men is based on an unprecedented series of interviews with Vladimir Putin’s inner circle, presenting a radically different view of power and politics in Russia. His recent book, The Empire Must Die, was released in Russian and English last autumn. It portrays the years leading up to the Russian revolution and the vivid drama of Russia's brief and exotic experiment with civil society before it was swept away by the Communist Revolution.